Public Transit Services funded in part through the Kentucky Transportation Cabinet Office of Transportation Delivery and the Federal Transit Administration (FTA). 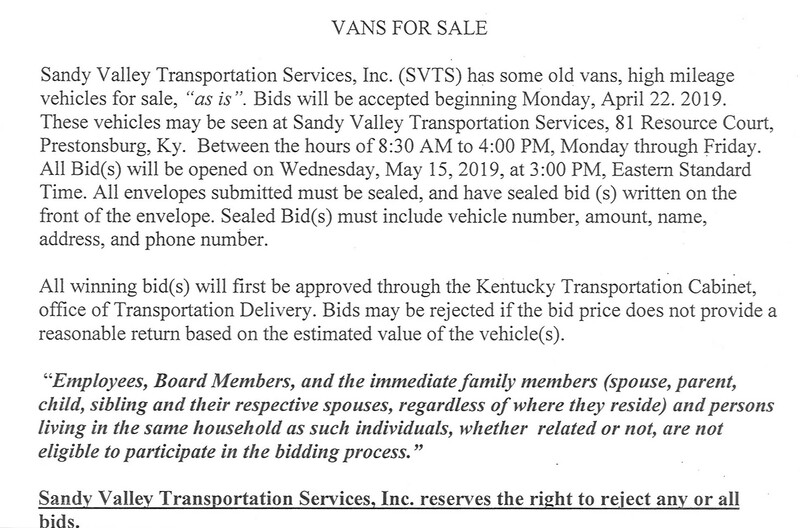 Sandy Valley Transportation Services, Inc. (SVTS) is a nonprofit demand response public transit system that has provided safe, dependable and affordable public transportation for the residents of Floyd, Johnson, Magoffin, Martin and Pike counties in eastern Kentucky since 1990. The public transit services are possible by operating assistance funds. SVTS is applies annually for operating funds for the continuation of the existing public transit services and for the expansion of transit services into other areas of the five – (5) county region. Dispersed populations and vast distances between communities characterize rural areas in Kentucky. Sparse population combined with the great distances and the lack of transit amenities intensifies the need for transportation services. The quality of available and affordable transportation in the Big Sandy Valley area has a direct bearing on the quality of life for residents. SVTS is proud to serve all the people of the big sandy area with emphasis being placed on serving the elderly and individuals with special needs. Many of these individuals rely on SVTS for their transportation. They depend on SVTS to go the doctor and other places like department stores, banks, grocery stores, drug stores, beauty and barber shops, social service agencies, jobs and many more places. Serving the elderly and individuals with special needs is emphasized by SVTS. Many individuals rely on this transportation for accessibility to health care services, stores, health and human service agencies and many other destinations. SVTS serves as the Section 5311 provider of public and inter-city transportation and as the Section 5310-lead agency for the area. Transportation is Provided for Kentucky Medicaid as well as Public transport: Cash Fare and Intercity Transportation. How to Schedule a Trip? The Federal Department of Transportation (DOT) has recently revised the rules for the American with Disabilities Act (ADA) and Section 504 of the Rehabilitation Act of 1973. The revised rules provide for public transit organizations to make reasonable modifications and accommodations to policies, practices, and procedures to avoid discrimination, and to ensure accessibility to individuals with disabilities. Sandy Valley Transportation Services, Inc. (SVTS), is committed to providing safe, reliable, courteous, accessible and user-friendly services to its customers. To ensure equality and fairness, SVTS is committed to making reasonable modifications to its policies, practices and procedures to avoid discrimination and ensure programs and services are accessible to individuals with disabilities. All requests should be made in advance by contacting Stacy Prater or Liza Morrow using the contact information listed below. To request a modification, please submit the following information: Name, Contact Information, service for which the requests pertains and specific details of modification requested. 4. The requestor would not be able to fully use the service provided by SVTS Transit without the modifications. ** The contents provided on this website will be available in other formats, upon request.